Before starting my juice cleanse this week, I had one last day of indulgence. What better time to indulge than at a Mother’s Day Brunch? 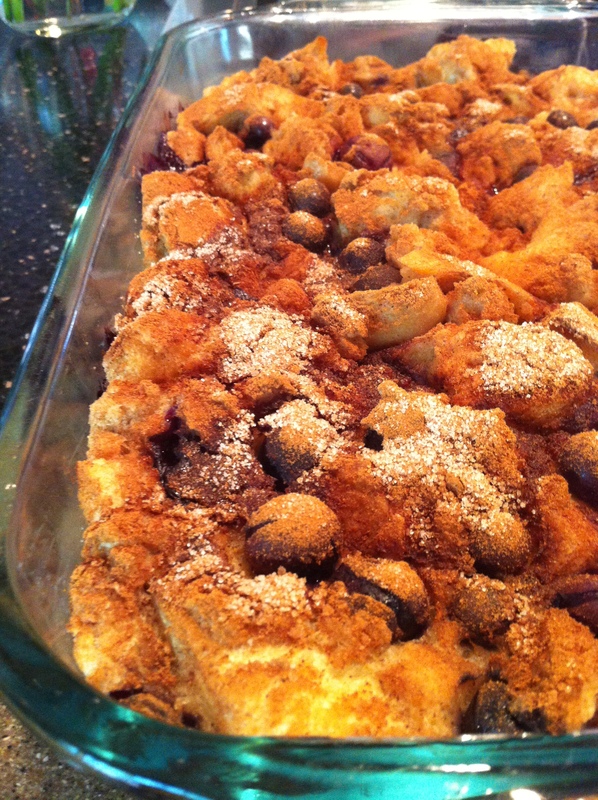 Enter French Toast Bake with Blueberries and Spinach, Mushroom and Feta Frittata. Instead of buying my mom a necklace or sweater or some other cliché Mother’s Day gift, I gave my momma a break in the kitchen. Cooking is relaxing, but it can also be tiring — as I learned firsthand this year. The most rewarding thing about cooking, though, is sharing it with other people. OK that sounds totally corny, but it’s really true! I love making a really special, unique meal and eating it with family and friends. Luckily, my brunch items turned out pretty perfectly, if I do say so myself. Either of these recipes would be great to try out for a special occasion spring brunch. While the French toast bake isn’t the healthiest brunch dish, it’s pretty darn good. 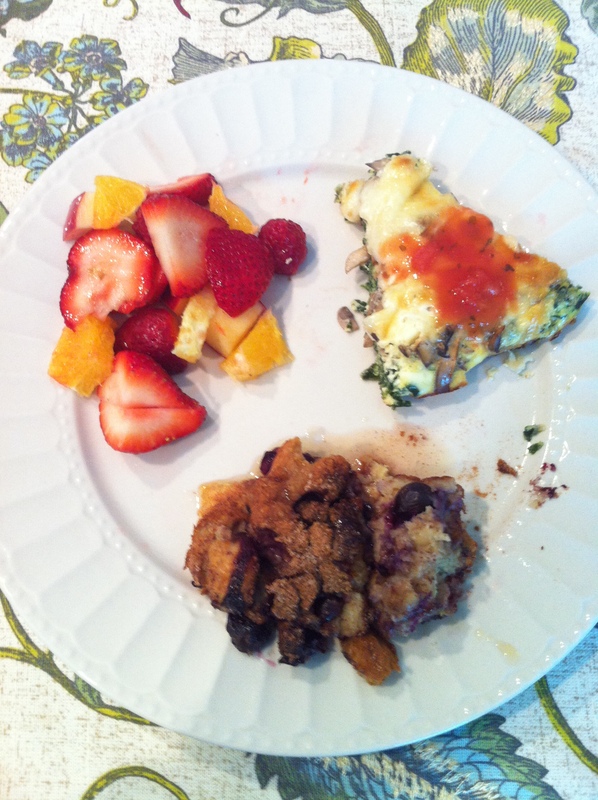 We served the frittata with salsa (on top) and fruit salad and bacon on the side. Really, no matter how you serve them, the frittata is cheesy and savory enough to balance the sweet and chewy French toast bake. Pre-heat oven to 350 (unless soaking mixture overnight, then wait until right before cooking.) Butter 9×13 in baking dish and set aside. In a large bowl, beat the eggs until frothy. Add milk, maple syrup, cinnamon, salt and orange (or lemon) zest. Add bread cubes and mix until well coated. Stir in blueberries. Pour mixture into prepared baking dish. If soaking overnight, put dish in the fridge. In a small bowl, mix remaining cinnamon and sugar. Sprinkle cinnamon sugar evenly over the mixture. Bake in oven for 45 minutes until top is golden brown and mixture is set. Enjoy it while it’s hot! Preheat oven to 350 degrees. Set out spinach to thaw or microwave. Empty the spinach into a colander and let it drain while preparing the rest. Quickly rinse the mushrooms and slice them thinly. Place the sliced mushrooms in a skillet coated with non-stick spray, add the minced garlic and sprinkle a little salt and pepper. Turn the heat on to medium-high and saute the mushrooms until they release all of their moisture and no more water remains on the bottom of the skillet (5-7 minutes). In a medium bowl whisk together the eggs until fairly smooth. Add the milk, parmesan and another small sprinkle of pepper. Whisk to combine. Pour this mixture into the pie dish over the spinach, mushrooms and feta. Sprinkle the shredded mozzarella cheese over top. 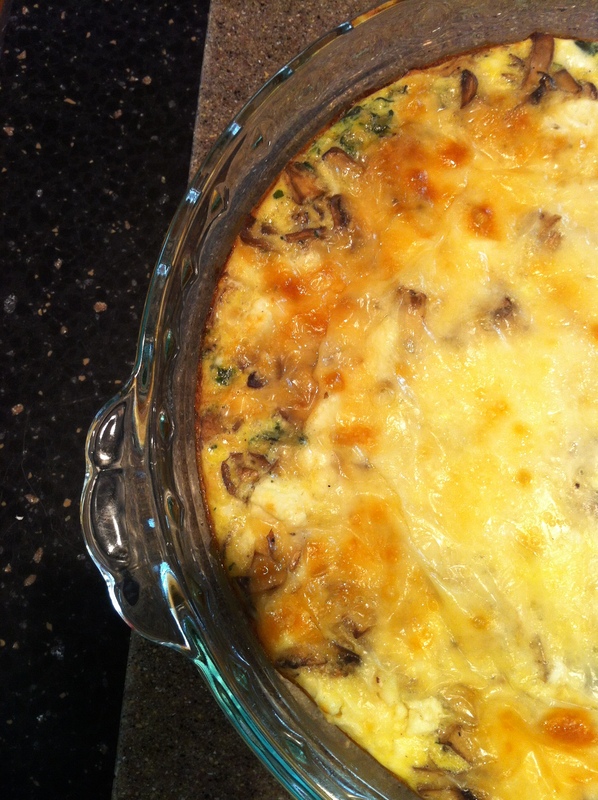 Place the quiche into the preheated oven and bake until it is golden brown on top and the center is solid – about 45 minutes. Slice and serve!